Service Availabilities In Rochester, Buffalo, Syracuse & Surrounding Areas In Western New York (NY) Near Me! Dealing with fish or koi pond problems, troubleshooting and finding the correct solution to repair these issues can lead to despair for many homeowners in Rochester, New York (NY). 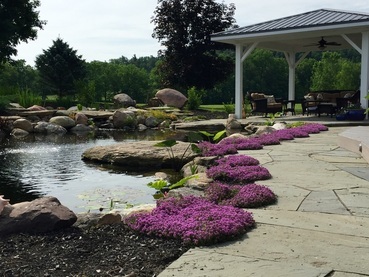 Acorn Ponds & Waterfalls have gained over 20 years of experience installing, maintaining and performing repairs on various forms of ponds and water features. 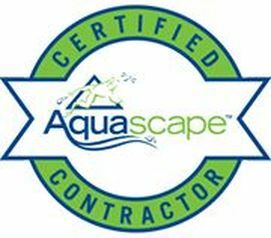 As Certified Aquascape Contractors, we have attended dozens of workshops and training events since 2004 to take the guesswork out of dealing with and solving these challenges you might be having with your water gardens. Here is a list of the top 15 most common pond problems we have heard over the years that might help you with your water feature. Pond Problem #1: My Pond Is Too Small! This is the number one problem for pond owners. 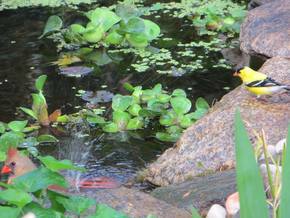 Most people who have backyard ponds or water gardens, wish they had installed a bigger one. Acorn Ponds & waterfalls recommends installing the biggest fish pond you can afford so you don't have to make it bigger and re-build it later on. 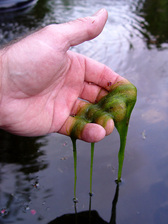 String algae in ponds can be a nuisance but it is not a problem or issue that can't be resolved or controlled. Having a small amount of algae in ponds is ok and helps make the pond appear more natural. If you feel there is too much, Acorn Ponds & Waterfalls can set you up with a program to control it. 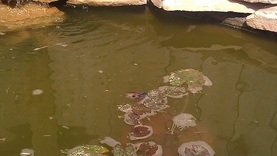 Having too much sludge on the bottom of your pond is awful and can lead to more problems. It is a good idea to address it before it gets any worse. Most likely, plant matter, leaves, fish waste, dirt, dead algae blooms etc. have settled down to the bottom causing pond sludge, muck or tea colored water. Acorn Ponds & Waterfalls recommend cleaning your Rochester, Monroe County NY pond at least annually and tenting your pond in the fall to keep out unwanted leaves and debris. Regular use of beneficial bacteria will help keep your pond looking good and there are also sludge removal water treatments you can add. Learn more about pond cleaning ! Click to learn about the water feature lifestyle! Many people want to install their pond as far away from the house as possible and we are always asking "how close can we get it?" With todays busy lifestyles many don't have the opportunity to walk out to the back of the property to relax by their pond. Water gardens should be installed as close to the viewing area as possible to maximize enjoyment. Imagine kicking back on your Rochester New York (NY) paver patio and watching as the fish swim around and look for something good to eat. It is very relaxing and similar to watching a fire. Enjoy your pond right from a kitchen or living room window as birds, frogs and butterflies are enticed by the sound of water. Humming birds will be drawn by the the sound as well when their favorite pond plants begin to flower. Ornamental pond fish such as goldfish and koi are the jewels of ponds & water gardens and it is difficult when we loose them. There could be too many fish in your pond and their waste may be causing nitrate levels to increase or you could have a predator such as the infamous blue heron(discussed in Pond Myth #1) visiting your pond. 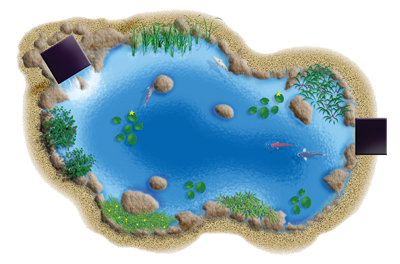 Click to learn more about aquatic pond plants ! There are many varieties of beautiful plants for water gardens. Most flowering plants require 6 hours or more of sunlight. 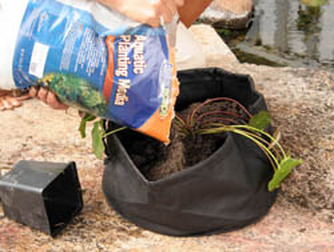 Adding fertilizer to your pond plants will help produce gorgeous blooms all year round. Acorn Ponds & Waterfalls can divide, replant and fertilize your plants during the spring pond cleaning. Perhaps you would like to add some tropical plants for extended bloom time. 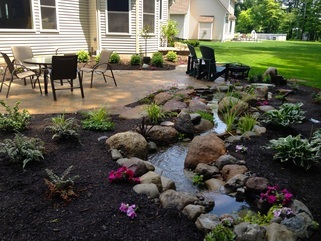 Finding and repairing water garden leaks in Rochester, NY can be frustrating to deal with. 95% of the time the leak issue is in the stream or waterfall. If you go around the perimeter of your pond and waterfalls, you could find a low edge that just needs to be built up again with soil. 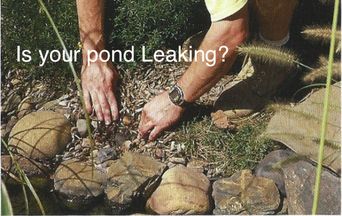 Let us help you with your Pond Leaks! 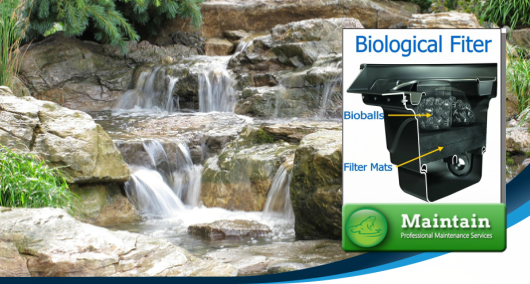 Click to learn more about Aquascape UV Pressure Filters ! There can be several factors as to why your pond has green water. Acorn Ponds & Waterfalls recommend cleaning your pond at least annually to take out nutrients that may be promoting algae growth. There are other factors such as poor circulation, not enough plants, beneficial bacteria not being added regularly and/or inadequate filtration system that may be causing your pond water to look green or cloudy. If you have all these things in check and you are still experiencing green water in your pond, you could try adding an Aquascape UV Light Sterilizer. Birds require shallow areas to take baths. When designing and installing ponds and streams, we create different levels or shelves. In streams we create beds and turns where the water can slow down and is shallow for small critters to get a drink easily. These shallow areas are perfect for marginal plants to grow and frogs love to hang out in plants or on moss covered rocks to catch any bugs that pass by. Click to learn more about ponds & wildlife! 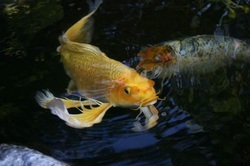 Replacing koi pond pumps can be expensive and sometimes unnecessary. Why did your pump stop working? Sometimes it could be as simple as cleaning out the intake at the bottom where the water is drawn in, maybe a piece of gravel or mulch got pulled in there and just needs to be removed. Is your pond leaking? If there is not enough water in the pond, it could cause your pump to burn out. 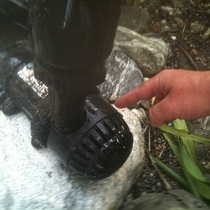 Do you have to constantly clean your recirculating koi pond pump to get it to function well? If this is the case, you probably have your pump located on or near the bottom of your pond. Debris from trees and plants that fall in and settle down to the pond floor will get pulled right into your pump. A pond skimmer will remedy this situation. 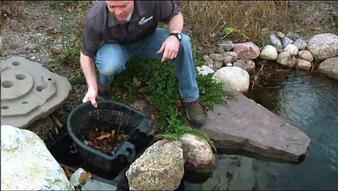 Acorn Ponds & Waterfalls can install a skimmer to most ponds and your pump will be protected. The pump gets housed inside the skimmer where there is a small net to catch debris before they settle to the bottom. 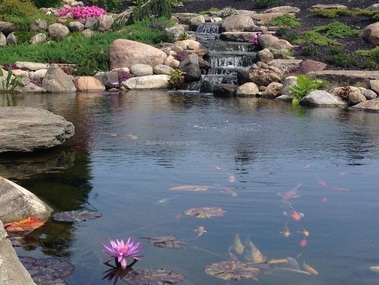 Installing waterfalls and streams can add beauty & functionality to ponds. A pond just by itself is great but you are really missing out if you don't install a stream and waterfalls. A babbling brook or tranquil waterfall not only make your water garden look natural but can be so relaxing to listen and watch as the water cascades over and around the rocks. Learn more about stream & waterfall installations ! 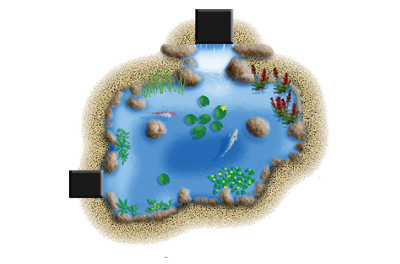 Click to learn more about pond filtration ! 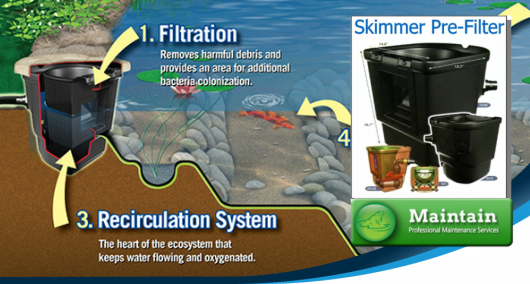 Not having a filtration system for your pond can lead to many problems. 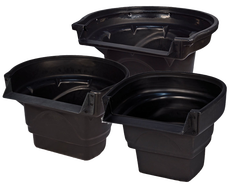 Not having a proper pond filter can be the cause of seven of the above mentioned problems. Not only do pond filtration systems help keep your pond looking great, they will save you a lot of time performing pond maintenance. 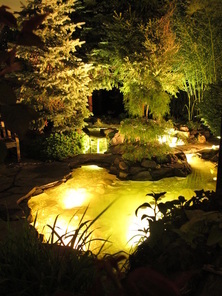 Adding lighting to a water feature can double your enjoyment time! Installing a pond without lighting is like buying a car without tires. Lighting is necessary to be able to enjoy your pond at night and you are really missing out if you don't install proper LED Landscape Lighting or Underwater Lighting to your water feature. Learn more about underwater pond lighting! 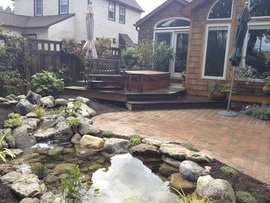 We can set your koi pond up so it will maintain itself in Rochester New York (NY) ! Though a properly designed and installed pond will reduce pond maintenance, there are a few things you will need to do to keep it looking great. The work required is less than if you had planted grass! For those of you who don't mind the occasional gardening, this won't be a problem. For those that would like to spend as much time as possible enjoying the pond and as little as possible working on it, we can help! 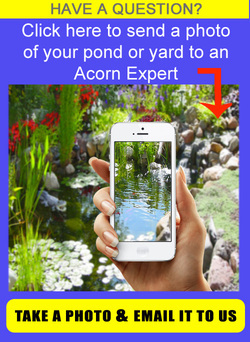 Acorn Ponds & Waterfalls has pond maintenance programs available so you won't have to do anything. We can rock your pond so it is safe to stand on the edge and feed your fish. When you walk around the edge of a properly installed pond, you shouldn't find loose rocks or other unnecessary safety concerns. Acorn Ponds & Waterfalls build ponds to last and to be enjoyed. 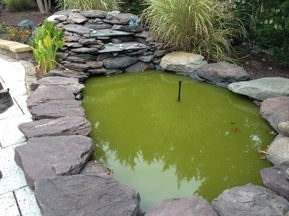 Some of our pond repairs for customers are designed to allow greater accessibility to the pond, and ensure you have a safe place to stand while feeding your fish, and safe footholds to walk around your pond. People want to get as close to their pond as possible (without falling in) – we can help. E-MAIL US YOUR POND PROBLEMS ! Click to learn how to reduce pond maintenance! 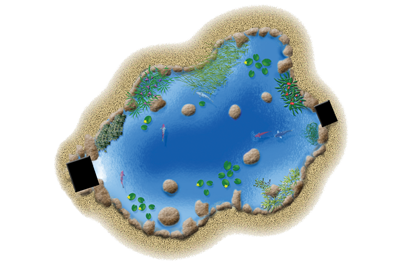 Enjoy clear water in your pond with the correct filtration system! What Type Of Koi Pond Are You In The Mood For? Get on our spring pond cleaning list early in NY! Get answers to your NY pond questions now!